For those of you who like the classics, time for me to rehash my France collection thread. I've a got a surprise addition that I had left out of my original thread on the old Stamp Bears board; it will eventually appear further down this thread. A little background first. 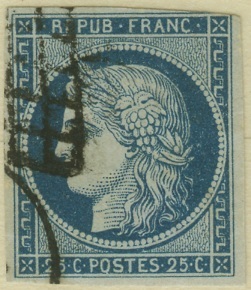 I'm actually not overly fond of French stamps, even though they comprise a major section in my WW collection. Many years ago, I purchased a moderate French collection because I couldn't pass up a fantastic deal. It was in old 1939 Y&T specialized France album. I fell in love with the album pages (paper feel, simple but elegant design, color border...). I didn't want the pages to be lonely with all those empty spots, so I started to try to fill in the blanks. We start off with the 1st issue Ceres heads of 1849-1850. In general, I will be ignoring color varieties since my scanner and your monitor may not reproduce the colors accurately (that's my excuse for admitting that I'm not good with distinguishing colors). No bottom margin and barely cut into at upper left, but I'm happy. Great huge margins on 3 sides, but alas, top margin is cut off. Well, 3 out of 4 is still better than 2 out of 4. This stamp is actually not difficult to get -- so I was able to acquire it with nice sharp cancel and 4 full margins. 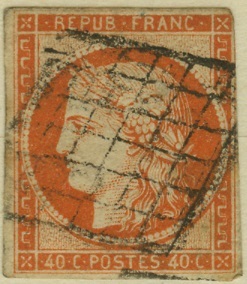 France #4 does not exist used, so it is not in my collection. My wife says I'm great at coming up with excuses. One of my favorites, because it has "7" as a catalog number; and yeah, because it's ORANGE! Question from a newbie!!! Why does Scott's drop stamps in there listings? 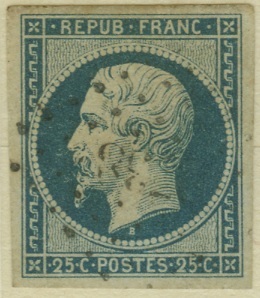 Here's my France #8(1849). I haven't gotten it experitize, yet. It's on my list of things to do. Why does Scott drop stamps in their listings? This is the last of the 1st issue Ceres. Not that easy of a stamp to get with 4 full margins, so I'm very happy! Whats amazing to me is the diamond shape, grid cancellation on the first couple of scans. Those are super cool. Thanks for sharing, and look forward to more. Thanks, kacyds! Will you be resurrecting your Hawaii thread (or maybe you did and I missed it)? You had a really nice Hawaii collection. 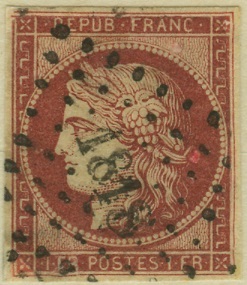 The grill/lozenge cancels are extremely popular among collectors of classic France. I forgot about mentioning them. They come in many flavors: grill, endless grill, star, diamond(lozenge) with small/large numbers... In the distant future, I might start a thread on them, but not here. In the above stamps, the #1,3,6,7 show the lozenge grill cancel of 1849. #2 shows the endless grill cancel (sort of like a roller cancel). #9 shows the diamond with small numbers (the number IDs the city). I was going to start my Napoleon heads, but my #10 is not in my album. I guess I admired it so much when I bought it 5 years ago, and was too busy patting myself on the back for getting a great deal on it, that I never got around to sticking it into my album. The next definitive series is known as the Napoleon heads. There are several sets in this series. 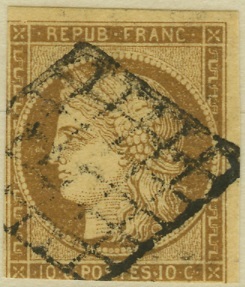 The first set/issue, consists of 2 values, and are easily identified by the inscription "REPUB FRANC" at top. They show President Napoleon III. Loving these. You're inspiring me. I haven't worked on my mint and used France collections in a while. Maybe I'll tend to them after I finish getting my used Canada collection back in good order (which should be very soon). Hoping to see your France stamps as well, Craig! I enjoyed looking at your covers in the other threads! 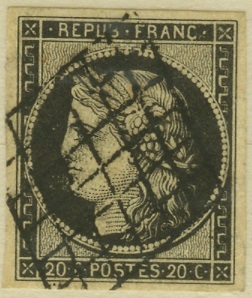 Can't go back to edit, but the #1818 small number lozenge cancel on the Scott #9 (1fr Ceres) is the cancel for Lyon. khj, you have inspired me too. 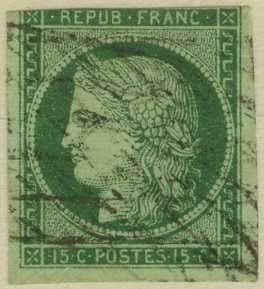 Lovely stamps and this reminds me I will have to get around to re-posting my France collection as well. I have an accumulation of Ceres and Napoleon heads that I have not explored too deeply and have not mounted. Make sure your health coverage is up to par. Messing around with the color varieties will drive you crazy (especially with used stamps). I pretty much ignored color varieties and just posted the stamp that had decent margins. I can't say that I have ever been one to look at colors all that much and probably for the same reasons you do. It seems too subjective and unless I have a reference to help me I can't tell the difference between subtle shades. This has nothing to do with my vision but just the simple understanding of what it is to be "rose red" vs. "red" vs. "carmine", etc....I am sure you get the idea. One thing though, that has helped me is to google the specific color shade and then use the google image feature to give you a page of that color as a sort of reference. There are also arts and crafts websites that show different standard colors...below is an example. Well, actually, most of those stamps I only had one of... it's not like I had much choice.